OK so I don't want to use tagboard all the time so here's a few vero layouts I've done recently. I like axial caps so most have been done with those in mind. 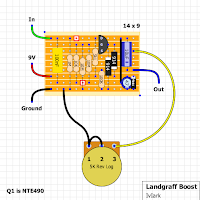 1 - Put a 100uF filter cap between 9V and ground rails. 2 - Put a 47pF cap between the base and collector of Q1. 3 - Put a 100 ohm resistor in between the 22uF cap and ground. If you do those you should get rid of the squeals. If you turn the tone of your guitar down then it will be taming the signal which would account for it removing the oscillation. In terms of it actually getting brighter?! Well you've got me there! :o) Admittedly though I haven't messed much with my guitar tone controls with a Fuzz Face, so I'm probably not the best person to comment. Ok. Step 1 & 2 is a major improvment Thankyou. Not sure what you mean for step 3 ?? I disconnected neg(-) end of 22uf cap to attach the resistor, then back to ground and got no signal, so that's not what you meant I'm guessing? Yes exactly. Disconnect the negative lead of the 22uF, and solder it on one of the free rows above it. The third row from bottom is totally free so you could put it there, but wherever best fits with the components you're using and just put in an extra track cut if you need to. For instance if you use the fourth from bottom row put a cut in to the right hand side of Q2 emitter. Then solder a 100 ohm resistor between that row and ground. Actually I've just had a look at how I did it last time, and instead of that I left the 22uF where it is, took out the link and put the 100 ohm resistor from Q1 emitter to ground. Just built this one sounds great. Thanks for uploading this link. With BC183s this thing nails the black hole sun sound. Thanks for adding the mods to get rid of the pesky oscillation. I had one question though, is the first component labeled 100 on the left the 100uf capacitor? it's quiet, THANKS very much mate. I'll work out how to put a picture on here at some stage, have built a few of your layouts. Thanks for your time, much appreciated. Oh, I did it already! Great, glad it sorted the noise. Yes it will sound slightly different but that's the price you pay for silence unfortunately. What transistors are you using? I've always got more oscillation using BC108's which are quite high gain, but if you use something lower gain like a 2N3903 then you may get away without any anti-oscillation measures and they still sound great. Well the BC108Cs could be really high gain because I think the spread is from 400 to 800hFE, so it's still worth trying the 2N3904s just to see what you think. They aren't as low gain as the 3903s but it could still make a difference. I always seem to find the BCs sound harsher to me. 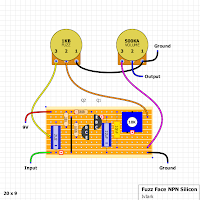 I just built a PNP fuzz face myself, using the fuller '69 mods (started as a '70 silicon but didn't like it enough to box it up) and yeah with certain transistors there can be a lot of....sound effects. I did notice too that the caps to reduce it did affect the tone. I can verify that the guitar does indeed brighten up when you roll back the volume on your axe. I actually am just blown away at how this circuit cleans up and reacts to guitar volume--I love it! Seems like most guitars get dark anyway when you turn them down, or, a pedal like the DS-1 or Big Muff you'd probably never want to roll back your volume because of muddiness. The Fuzz Face is exactly opposite of this!! I can see why Jimi was all about this..it sort of becomes part of your amp. Same thing with Jimmy Page and a good marshall, les paul, and Tonebender MK II. I'm converted, or, at least, can appreciate the old school effects for what they offer. I kind of have fun messing with and testing germanium transistors and all that. Silicon is great for lots of things, but, in my opinion, can not be equal to germanium in a circuit like the Fuzz Face or Tonebender. There's just that sound you can't get with sili. The fat squonky pick attack or however you might attempt to describe it. Good stuff. 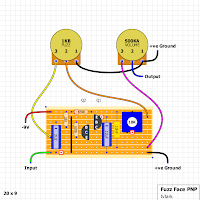 I am attempting this Fuzz Face NPN build, and as it's one of the first I've tried that isn't a kit, I am a little confused as to how to the multiple grounds work, as well as how the jacks and DPDT jack would be wired up. 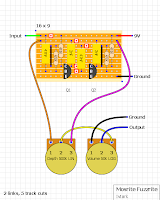 I've consulted other sites (gaussmarkov and beavisaudio), but I'm a bit confused as I'm not using a 3PDT jack... any information about the grounds or jacks that you could help with would be most appreciated. I left it off because once the cut is placed for separation between the two bottom lugs, it doesn't matter whether you solder it or not. This is just used as a variable resistor and only the two marked lugs have to be connected. Well, I'll go stock up on some axial mojo parts and build another as I just used standard parts for this. Actually on further testing it sounds bad..initially it sounded good but now I'm hearing crackling etc while playing, tried tons of transistors and biasing with the same results. I don't know what it is with these but mine seem to come out bad. Maybe it's just the way they're meant to be but to my ears, something never sounds right with them. I think I will re invest in an MXR classic 108... I remember that being a great fuzz face. I think it's a biggy mate.. It houses about 8 transistors which I think some of which are for the buffer switch. I've played with this one some more and it does sound really good, it just seems to crackle when played lightly or when notes fade out. I'm sure the MXR did this at lower gain settings too, just not as bad so it may just be the nature of the beast. But I really like the way it cleans up with the guitar volume. That's not too big mate, I've done lots bigger than that. Leave it with me. Ivlark!!! Can you help me plsssssssss?? with your knowledge you will solve my problem. OK, newbie ALERT ! I've got hold of all the parts for the NPN FF but i'm a bit stumped with regards to the transistors and pinout. Now, i'm asuming that one of them is a BC108 with the pinout of CBE but what is the other one. I did assume that both transistors were BC108's but 'cos the pinouts are different it can't be a BC108. Aha, now I've got it. :-) Thanx very much. I kind of guessed a smuch but just wasn't to sure. Thanx again man. Sorry IvIark, slight little problem. I'm more than 99% sure i've got this right apart from a tiny-weeny little mod. I used an 8.2k resistor in place of the 10k trim pot purely cos I didn't have one. Should this make any difference ? I've also put a LED in as well. Now, what i'm getting is the usual true by-pass but when I hit the switch (LED lights) and i'm getting pretty much the same sound as with it turned off. The volume is fine (up and down) but there is no fuzz whatsoever. 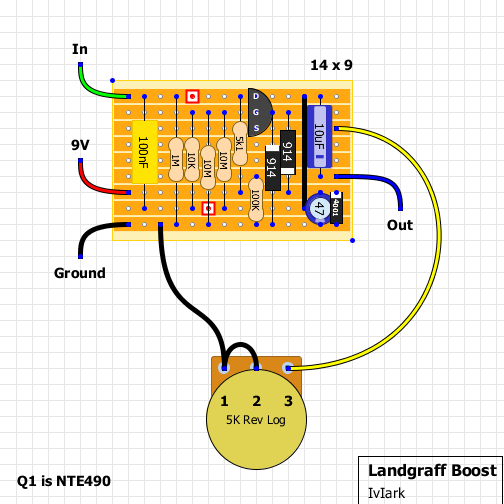 I've also got the Grounds going to the output jack and the Battery Neg going to the input jack. Is that about right ? Sorry for all this and I know its pretty much a basic build but theres something i'm just getting plain wrong. 2k2 doesnt work for pnp fuzz face.... Also i have volume drop :( tried 2k resistor in place of 470r and raise. Bit but its still low.. Any recomendation? There's definitely some mistake in your build. Did you notice the pinout of Q1? Built the FUZZ FACE Silicon NPN, put a couple of Philips BC109 in sounds awesome, in fact I prefer this FUZZ better than my ANALOGMAN SUNFACE BC108. I used a 100pf Ceramic to deal with the oscillation sounds a dream now really pleased . Pics may help. Post some hi res in the forum section and we'll get a look. I can't load the images of the vero's. Anyone else got this problem too?